Thanks to everyone who provided feedback on the 2010 version of the Nmap Cookbook (now renamed Nmap 5 Cookbook). 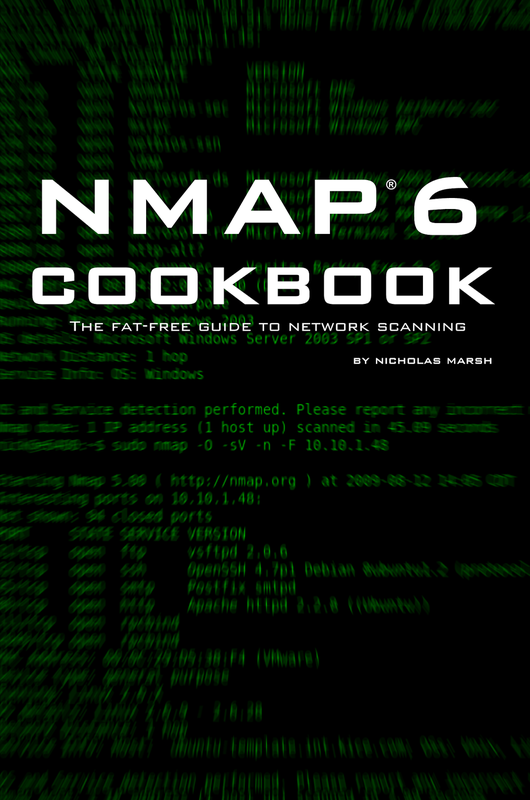 The new and improved Nmap 6 Cookbook is now available at Amazon. I took some time off from publishing, but I'm back. I'm working on an update to my Unix/Linux command line book, and also a new guide about VMware. Writing has been fun, but it hasn't been easy. Most people seem to like my "fat-free" writing style, based on the positive reviews I received. The hard part has been facing the negative criticism from the folks who didn't like it. I've taken the feedback from those critics and made many improvements with the Nmap 6 Cookbook. I never intended to get rich or famous by writing. Luckily, neither of those things has happened to date. I've given away more books then I've sold, but I did have a good run on Amazon for a brief period a few years ago, and the extra beer money was much appreciated. I also haven't been sued, threatened, or hacked yet, which is encouraging. I've had three major publishers offer me deals to rework the Nmap Cookbook into a "real" book, but I turned them all down. It seemed like too much pressure and I didn't want to sacrifice my fat-free approach just for the chance to make some "real" money. I do this for fun, and I do it for me and people like me who just need a jump-start (and can figure out the rest on their own). Nmap is such an awesome and useful tool, and Nmap 6 builds on that with Nping and Ncat. I hope that this new version of my book helps lots of people out there discover the joys of network scanning with Nmap. Thanks for reading. Enjoy free Kindle e-book downloads this week and many more in the future. Note: Amazon limits me to 5 free promo days per a quarter, but I try to do a free download day at least once a month. The Nmap Cookbook is now part of the Kindle Lending Program. This allows Amazon Prime Subscribers to download The Fat Free Guide to Network Scanning for FREE! Download for FREE with your Amazon Prime account! Download the Nmap Cookbook Kindle eBook for only $4.99. Available now at Amazon.com BarnesAndNoble.com and Createspace.com for purchase today. 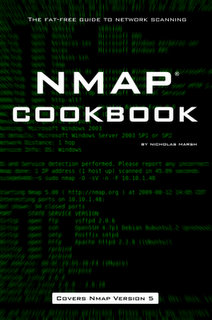 The Nmap Cookbook provides simplified coverage of network scanning features available in the Nmap suite of utilities. Every Nmap feature is covered with visual examples to help you quickly understand and identify proper usage for practical results. Provides complete coverage of Nmap 5.00 features. I take great pride today in the fact the Namp Cookbook has briefly taken the number 1 spot on Amazon.com Under the Security and Encryption category. First of all, respect to Fyodor for creating an amazing program. I highly recommend his book Nmap Network Scanning: The Official Nmap Project Guide to Network Discovery and Security Scanning for those wanting to take their knowledge of Namp (and other advanced network/security topics) to the next level. For those who are just getting started (or anyone who needs to master Nmap quickly) thank you for helping make the Nmap Cookbook a popular choice among the Amazon masses. I also want to take a moment to thank CreateSpace (a service of Amazon.com) which allows regular people like you and me to self publish their books. Nmap is an open source program released under the GNU General Public License (see www.gnu.org/copyleft/gpl.html). It is an evaluable tool for network administrators which can be used to discover, monitor, and troubleshoot TCP/IP systems. Nmap is a free cross-platform network scanning utility created by Gordon “Fyodor” Lyon and is actively developed by a community of volunteers.